Happy hump day, my friends! 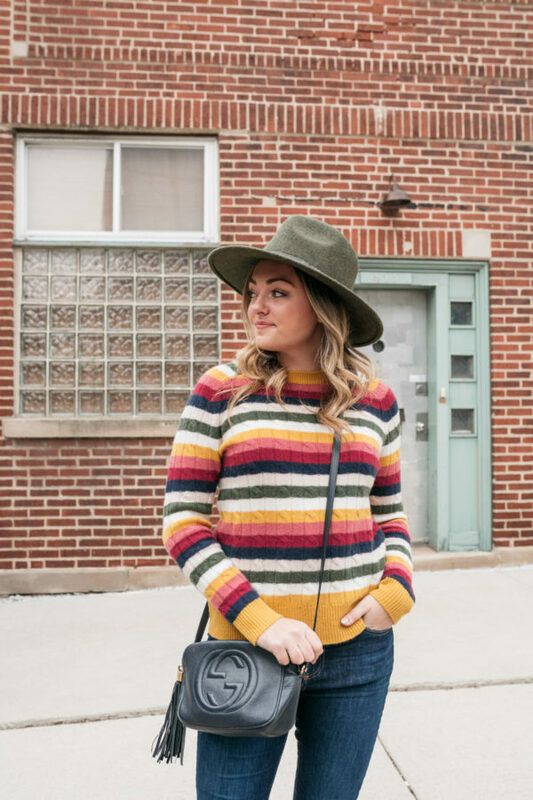 Today, I’m sharing one of my favorite new additions to my closet, as well as a few tried-and-true staples that I’ve had in the mix for a while. 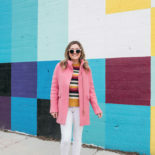 I’m all about the candy-colored stripes lately! 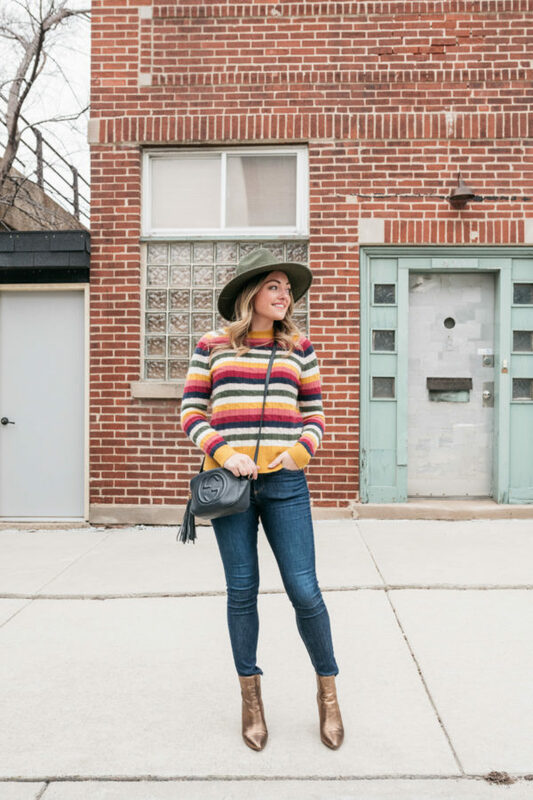 There are so many cute, colorful, cozy sweaters right now and I think they’re a great way to add a little pop to your outfits now and will transition so well into the spring, too. 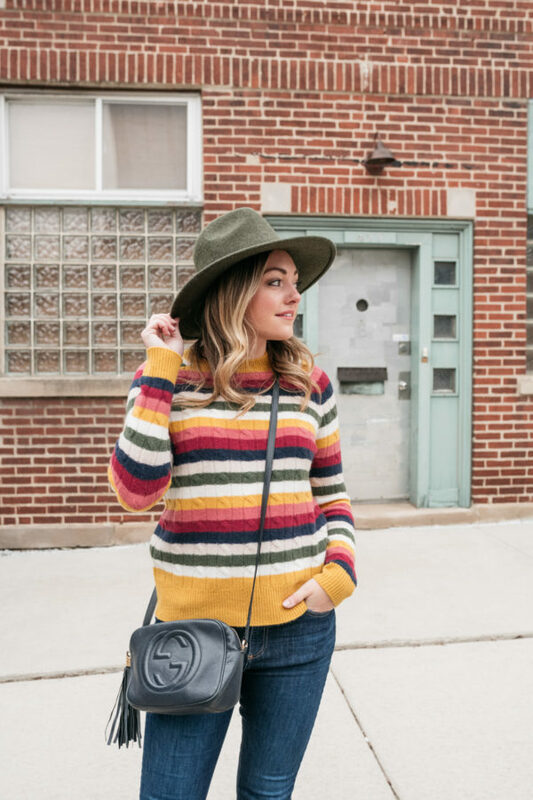 This particular cashmere crewneck from Nordstrom is perfect to pair with all of the navy, olive green, and pink that I wear. 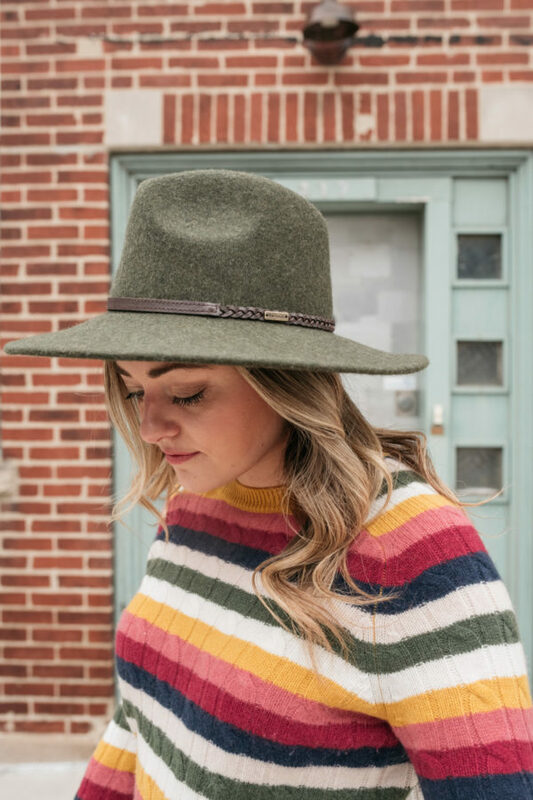 I was trying to find the outfit where I’ve previously posted this olive green wool hat on the blog, but I’m realizing it must not have actually made it on to the blog. 樂 You can see it in this Instagram post though! I got these metallic bronze booties on sale a few years ago (they’re by Vince Camuto), but unfortunately they’ve long been sold out. 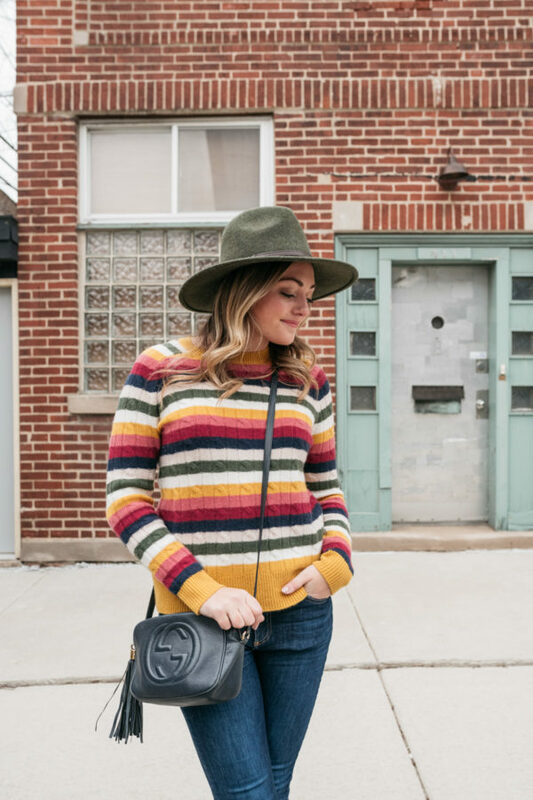 (To see how else I’ve styled them, check out this outfit on the blog from last fall/winter… It’s one of my all-time favorites!) I found a few similar styles available now, though! The metallic leather is so fun to dress up an otherwise simple outfit, and metallics are surprisingly neutral and very versatile. Such a cute look! I love all the colorful sweaters that are so trendy right now. I’m LOVING the colorful sweater! The metallic booties are calling my name! I simply adore this outfit! 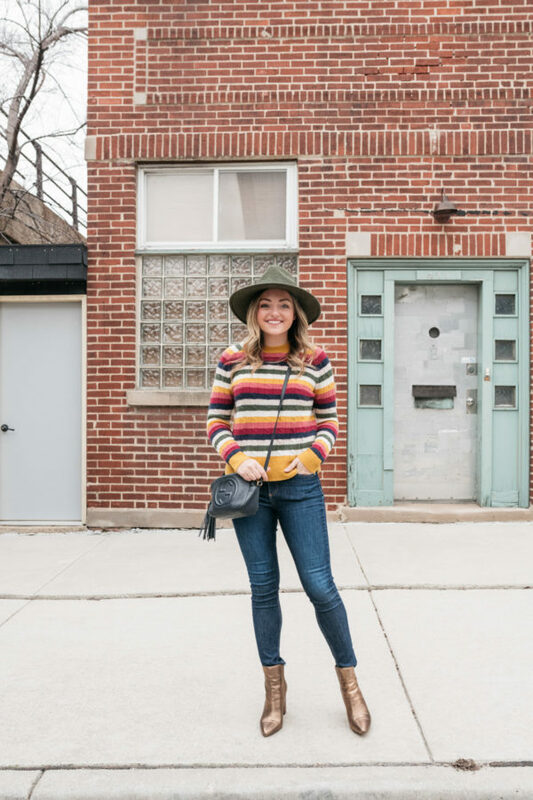 That colorful striped sweater is so cute! And who would’ve thought that metallic boots could be so versatile? LOVE the jumper – so gorgeous!! You look super beautiful in your striped sweater! 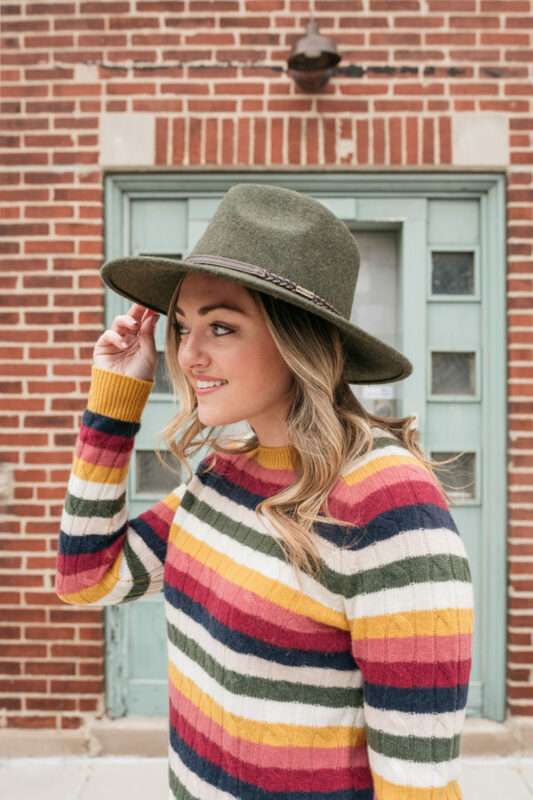 I love the colorful stripes. 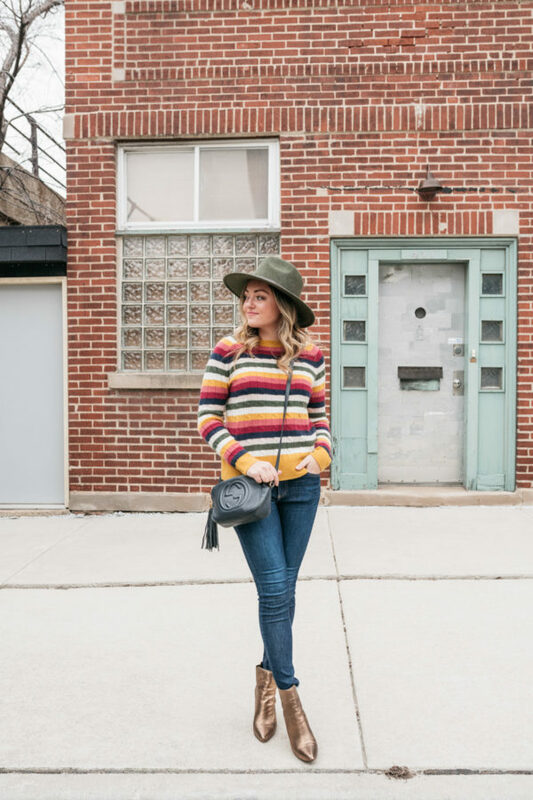 It’s such a fun way to add color to your outfit while still looking wintery. Love this look! 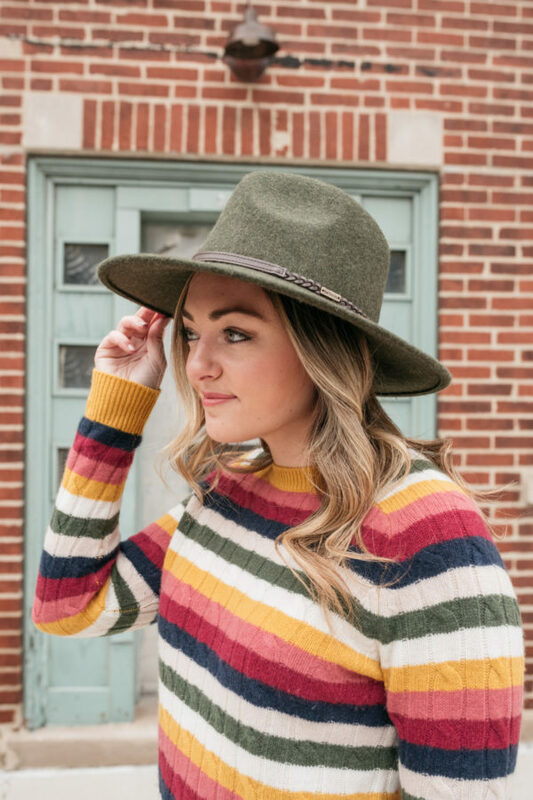 Could you do a post on what it’s like to be on a low-buy for clothes for so long (b/c of your RY trip). Did it change your perspective on how you shop? ?